IT'S A SAD AFFAIR THAT HE HAS GOT A WRONG PORTFOLIO BECAUSE HE IS RACIALIST AND CORRUPT HE LIVES UNDER THE SHADE OF MEDAMULANA TO COVER UP THEIR SINS. And DEALdasa s as well ! . His Excellency Mahinda Rajapaksa saved the nation from the LTTE terrorism in 2009, after the President Maithree took over the Beautiful Sri Lanka in 2015, created once again the same LTTE terrorism, appointing LTTE leader Sampanthan as Opposition leader, his comrade, C V Wigneshwaran, (LTTE) second in command, as chief Minister for Northern Province, whereby the country has been divided and the TAMIL EELAM installed. What are you talking about for an ill-considered nonsense? You are one of the people who sow racial hatred because you think your ethnic community is superior and owns Sri Lanka alone. You were only coincidentally born into this community. Do not forget that every Sinhalese has Tamil blood. The war was won only because Chandrika had already recaptured 75% of the occupied country and Ranil had persuaded "Colonel" Karuna to change sides. MR is in no way responsible for the victory He wanted to keep the status quo. He only agreed to finish the war after Gota and the generals had urged him to do so. Only with cruel human rights violations could the war be ended. It seems you still have some leftover bottles of arrack supplied at the MR’s recent get together at Lakehouse junction in Colombo. You must have consumed moonshine. What about DEALs as well . Economic problems causes most of the violent behavior. Say no to racism and extremism no matter which part of the country it's originated. 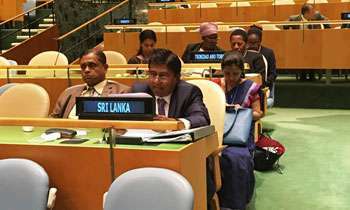 The minority communities in Sri Lanka too must learn to integrate with the majority community and live peacefully without wanting halal and halal. And sharia laws the whole time. The Sinhalese, Muslims, tamils and christians are all peaceful citizens if not for 225 rogues and cheats who are ruining and running this country.